The first recorded hurricane to hit Florida happened in 1523 when two ships, as well as their crews, sank along the western coast of the state. Before the year 1900, there are 159 known hurricanes that have somehow affected the state. 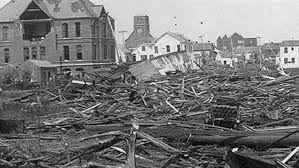 All of the storms before 1900 resulted in the loss of over 6,500 hundred lives, and caused monetary damages of over $90 million. Additionally, at least 109 sea vessels were forced ashore, wrecked, or badly damaged because of these hurricanes. Information from earlier years before legitimate hurricane tracking existed is not as wide spread. Technologies needed to study and observe the tropical cyclones was limited. As a result, Hurricane authorities like the National Hurricane Center recognize that some of the figures on death tolls, as well as dates the hurricanes happened, may not be entirely accurate. First of all is one of the deadliest Atlantic hurricanes of all time. In the early morning of September 17th, 1928, this storm made landfall near West Palm Beach, with deadly, intense winds of over 140 mph. Over 1,700 homes were destroyed in the city of West Palm Beach, but the most severe damage was around Lake Okeechobee. Intense storm surge led to water pouring out over the edge of the lake, flooding hundreds of square miles, sometimes as high as 20 feet above the ground. Entire homes and buildings were swept away in cities surrounding the lake. Consequently, at least 2,500 people died in the storm Surge. In total, this hurricane killed over 4,000 people from Puerto Rico, Guadeloupe, and Florida. This is the strongest hurricane to ever strike the United States. This small, but incredibly powerful hurricane caused intense damages in the upper part of the Florida Keys. The storm created a storm surge of about 18-20 feet, which engulfed the low-lying islands. Storm surge, paired with extreme winds, destroyed almost all of the buildings between the cities of Taverneir and Marathon. The town of Islamorada was leveled entirely. Large parts of the newly built Key West Extension of the Florida East Coast Railway were damaged immensely or destroyed. As a result of this storm, 500 people lost their lives, many of which were World War 1 Veterans working on the East Coast Railway. Of the storms that have affected Florida, none have been costlier than 1992’s Hurricane Andrew. When Hurricane Andrew made landfall at Category 5 in August of 1992, it went directly through the city of Homestead, located in Miami-Dade County. In Miami-Dade county alone, damages were estimated to be in the area of $25 billion. The winds, which sometimes would reach gust at speeds of 175 mph, destroyed 25,000 homes in Miami-Dade county, and severely damaged 100,000 more. In Florida, a total of 63,000 homes were destroyed, leaving about 175,000 people homeless. At the height of the storm, well over one million people were without power. 70,000 acres of trees were downed in the Everglades. Fortunately, modern day hurricane monitoring technology allowed the storm to take only 65 lives, and caused $26 billion in damage, making it the third costliest hurricane to ever strike the United States. Finally, 2005’s Hurricane Wilma is the strongest storm to ever be recorded in the Atlantic ocean. Wilma was the strongest hurricane recorded in the Western Hemisphere until 2015’s Hurricane Patricia. Wilma hit the Mexican Yucatan Peninsula as a Category 5. Then, Wilma made landfall on the western coast of Florida near the City of Cape Romano as a Category 2. Upon initial land fall in Florida, winds were about 120 mph. But, the storm weakened as it traveled eastward across the state. Wilma caused widespread destruction across Florida, and kept people without things like power, water, and sewage systems. As a result of Wilma, Florida Power and Light reported that over 3,200,000 customers, which left about 6,000,000 people with no power. Furthermore, most residents did not get the power restored for two weeks. This was the last major hurricane to hit Florida, almost 12 years ago. Restoration USA is a disaster restoration company located in Pompano Beach. With over 25 years of combined experience and expertise in Florida, Restoration USA knows hurricanes. Want to make sure your home is prepared for the storm? Want to know who to call after the storm? Restoration USA is here for you. We perform leak detection and mold removal, as well as water extraction and water damage repair. call (866) 745-6428 or visit online at http://www.restorationusa.com and ask for a free hurricane readiness home evaluation.